I’ve always felt our family to be fortunate to reside in such a scenic and environmentally-conscious community as Carpinteria. It’s late summer. We walk on the bluffs overlooking the ocean breathing in the clear sea air. I look up to see a red-tailed hawk flying high overhead. The ocean is calm. Bright-colored beach umbrellas shade the sunbathers below. Sometimes we see dolphins glide through the water. Today there are none. Kevin walks by my side. He loves to talk while we walk. Last June Kevin received a certificate of completion from Carpinteria High School. Kevin’s peers gave him a standing ovation. The typical students who grew up with Kevin in their class have learned compassion. They noticed Kevin’s challenges. Kevin tries so hard. It’s not only our children who benefit; it’s the typical students as well. For over fifteen years Kevin’s classmates accepted him in their classroom. Kevin was fully included until seventh grade and then when he had difficulties with puberty his IEP team decided a more restrictive setting could benefit him. Many Autistic children have difficulties in puberty. They are super-sensitive to the environment within and without their bodies. One of Kevin’s goals this year is to learn to tie his own shoes. This is the kid that is being portrayed as the next Adam Lanza. Pretty absurd, huh? Kevin sometimes repeats phrases, he gets stuck on ideas, his body sometimes jerks, he likes to play the “slap game.” He’s on medication that helps him stabilize his mood and not jerk. He’s also an artist. I promote him as I promote other artists in the Art of Autism collaborative. I want others to see the gifts of autism. I believe these children came to teach. This is my calling. “Kevin’s art isn’t very good and your writing isn’t good either,” the anonymous hate mail says. This person calls me a “stage mother.” When I open my email and see the long diatribe she’s written my heart sinks. I let Kurt read it first. He’ll recap it before I decide whether or not to read it. Now I’m looking for ways to ban this person from posting on The Art of Autism WordPress website. Along our journey we’ve had many wonderful therapists and teachers. However, a few parents and teachers have been less than accepting of Kevin’s challenges. It always surprises me when a parent of a special needs student is unaccepting. Aren’t our kids here to help us as parents learn compassion? An insider tells me they’ve never before witnessed such a campaign against a student with a developmental disability. “The educator is only looking out for her students,” another anonymous parent writes. She says I’m selfish as it’s obvious Kevin is a safety-concern. I don’t believe this parent has ever talked to Kevin. In fact, I don’t believe many of Kevin’s classmates have talked to him either. Kevin’s shyness and awkwardness has contributed to his being misunderstood … as well as flat-out lies about his behavior. His past aides have always been his best advocates because they know him well. This time, it again is his one-on-one aide who stands by his side. The aides who are advocates don’t seem to be too popular in this teacher’s class. At the advice of Kevin’s attorney we ask the Special Education Director for Kevin’s discipline report. One incidence last semester where he hit a student. No incidences of hitting teachers or aides. He has one incidence where the teacher was hit with a kickball eighteen months ago. I have a declaration from a witness it wasn’t even Kevin who kicked the ball. Of course, he got yelled at. Now Kevin has been conveniently moved to another state – thousands of miles away. We’re thankful though. At least he’ll be safe and we won’t have to leave town every weekend for fear of this teacher calling the Sheriff. Thanks to the parents in his class who wrote all those letters advocating against him, he now is part of a wonderful transition program. The kind our school district could probably afford if they didn’t spend so much money on Special Education attorneys. “Am I a disappointment?” Kevin asks. “It seems I create so much work for you,” he tells his dad. The day Kevin says good-bye I take a train out of Carpinteria to visit my best friend Nancy in Fallbrook. I stay there for five days. I’m not good company. I sleep most of the time. We talk about her advocacy with her son Ben. Ben was in jail and nearly died. “I can’t believe this teacher and these parents want Kevin in jail,” I tell her. We’ve worked together many years to keep people like Ben and Kevin out of prisons and jails. The Santa Barbara jail is the new mental health facility. A restraining order on Kevin’s record can have heavy implications. It can affect future housing opportunities and jobs. It’s going to take me a while to recover. Last week Shannon Penrod invited me to be on Autism Live televsion to talk about The Art of Autism project. I also had the opportunity to share Kevin’s story. A link to the entire interview is at 3:48 on the video above. “I like the snow. It’s pretty here,” he says. His dad accompanies him to Ohio. “It was sad when I left him,” his dad says. The temperature this week in Ohio ranges between 8 and 35 degrees. The novelty of the snow has worn off. “It’s so cold and I’m sick,” he says. When we moved to Carpinteria 17 years ago, I thought I would stay here forever – retire here. Even though the Art of Autism is an international project which highlights the gifts of autism, I feel I’ve not made much impact on my home community. Many view the neuro-diversity movement as the last civil right’s movement. Kurt and I will be moving soon too. Kevin, Kurt and I all are neuro-diverse people. We’re weird. We lack social skills. We are the freaks and geeks of our community. Sandy Hook shows how a community can either embrace an individual with challenges, or exclude and isolate them. A community can create an Adam Lanza or a responsible citizen. In a few weeks, Kurt and I will drive out to visit Kev in his new community. He’ll be back home in April for the Autism Chalk Festival in Covina and his next court appearance April 14. This will be his third continuance. It’s not a funny joke. Kevin resides in Ohio, yet this teacher is bound and determined to get a restraining order against him. “You boys stay away from each other, okay?,” the judge said at the last continuance. Kevin and the other student nod. I filed a complaint with the school district last week. They told me a while back this is a civil matter. It doesn’t concern them. Does it concern the District when the teacher brings the entire class to court? “Was this an authorized field trip?” I ask. “No, she did this behind our backs. We had a substitute and aide,” the Special Education Director assures me. “I’m so sorry,” she says. Lots of people tell me how sorry they are. I bet the School District loves this. Parents fighting among each other distracts from the real issues – what skill set is our twenty-something Autistic child learning to be able to survive in this complex world? It appears Kevin’s transition class is learning about the justice system and how to file restraining orders. One thing I know to be true. Carpinteria is no longer a safe place for Kevin. He may never be able to come back here and live. We’re now looking long-term to other cities. Many kind people have emailed offering programs in communities across the country. Many people are following this story. I receive emails daily. I don’t have any answers. All I know is there are many Kevins out there and many moms and dads who worry about their children’s future. On Friday, February 7, I’m honored to be part of the Vibrant Brain Summit talking about autism at 4:00 PM PST. I talk about the gifts of autism. I’m now in the midst of writing a book about Kevin’s journey. I’ve been writing this book for a number of years. Yet another chapter closes. I hope the next will be a happier story. End Autistic Discrimination has a Facebook page. 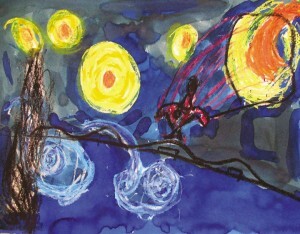 Kevin’s art is on display at the Art of Autism exhibit at the Good Purpose Gallery in Lee, MA from Feb 7 – March 10. Note: I’ve chronicled Kevin’s journey in a number of blogs on this website. There have been a number of wonderful organizations and people who have supported Kevin in Carpinteria including Kiona Gross and The Curious Cup, The Carpinteria Arts Council, Friends of the Library, and Cate School. Thank you Debbie for illustrating the need for tolerance and calling out injustice. These educators should be helping students accept autistic classmates. I am sure the majority does and have had some tribulations in executing these lessons. But from what I read it was not handled the right way. Now Kurt my best buddy from the 70’s apparently is leaving my beloved town. I am glad you pointed out the helpers and the detractors of certain blogs. I believe you when you point out that Kevin can be trusted and he who would never harbor or plan violent agendas. I am disappointed that this agency has definitively documented his hitting incident, when this could of been handled better. I agree that all must be done to prevent violence in the school place but to have a few in power document an incident that had no long term or premeditated malice is too much. I hope they thought they were doing it for 100% Safety requirements and not documenting incidents to support their annual salary and terrorism/safety programs that in this case took my friends away from the city I love. With all the different people that we live with. Thanks Mike for being a good friend. All of us at KindTree are in your debt, Debra and Kevin. Your art program inspired us to do our our own “Autism Artism” program in Eugene, Oregon, providing exposure and income for 85 artists so far. Kevin’s offerings that we have are so outstanding., and we are so impressed with both his work and the work that you are doing with your great program. I wish you were here in Eugene. You are both truly American Heroes. Thank you Tim Muller. Kindtree.org rocks! I agree with another’ parents point of view ” half of what you read might , or is hiding the truth”. I also believe what Buddists have said for centuries that truth is always in the middle. My previous comment is not angry. Seems like yours is more? I just happen to believe that the melting pot of different looking people and different acting people can be better served without over reactionary agencies that are quick to solve problems with procedures that are not inclusive. Debbie I am so sorry for your struggles, not with Kevin, but with over reactionary parents and procedure prone authorities. I know Debbie has done so much for this wonderful son. His art is exemplary. His personality is different like a peacock bird. Distill it to the middle and he is not a threat. They are beautiful yet they also have an annoying loud call. You choose the attributes. It will be in the middle. Debbie is a wonderful mother and detailed writer who speaks the truth and chronicles the eroding support for her talented son in some sphere’s, but she always complements and acknowledges, with gratitude, all of the many who have helped Kevin for all his teenage years here. I think your boiling water analogy could use a new one. Maybe one of forgiveness? The face of our community will evolve and be much richer for what different cultures and autistic people are and do. Kevin has accomplished so much in our city until a few episodes made someone fill out some paperwork of non compliance with whatever “normal” people are and do. If we are in the middle than lets all join in. Beautiful words Mike. Thanks for supporting Kevin and our family. Can’t wait to hear some of your new songs. Jmoll, And I’d love to know the FACTS and what has been said to stir such hostility and hate. I’m still waiting to hear the other side of this story. And please refrain from posting on this website. Your last comments were egregious and beyond ignorant. I’ve deleted all your comments.